Hydration and blood sugar are crucial during intense physical training. Our staff nutrition expert explains how a solid eating plan may be the key to avoid training failure. For more go to www.SEALSWCC.com. What we put in our bodies affects everything. Today we sit down to talk with a Navy SEAL and SWCC nutritionist. You'll hear from my colleague, Angie Giovannini as she speaks with Justin Robinson about the ... See More importance of nutrition during and after training. AG: Thank you for taking the time to talk to us a little bit about a really important pillar of training, which is nutrition. 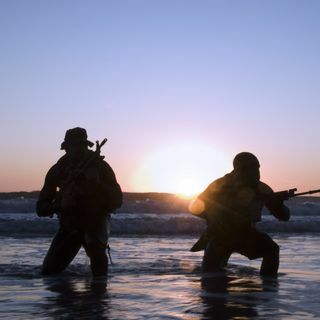 If we could just start out with you giving us a little bit of your background and how that fits into your work here at Naval Special Warfare. That would be really helpful. JR: Great, well I'm happy to be here, too. I've been working at this Center, AKA the schoolhouse, for the last two and a half years. So, I started in June of 2015. Before that, was teaching college for a year, was in a similar position to this with an Army unit for a couple weeks before the government that had some cuts that came down, so it's nice to be back into that system. Prior to that, I worked in professional baseball. I did a dual undergraduate in kinesiology and nutrition, and then my master's degree is in kinesiology as well. I am a registered dietician and board certified specialist in sports dietetics, which I know is a mouthful, but…it's the sports nutrition credential for dieticians. AG: And so what drew you to Naval Special Warfare? How does that all fit in here? JR: Really just working with people who are highly motivated. I've done the general training. I've done the personal training, I've done the general nutrition counseling, worked in the hospitals, and that's great. You can make an impact, but I feel I'm at my best when I'm working with people who are highly motivated, people who will push me to do more research, to read more articles so I can come back to them and provide them with resources and information that will improve their careers, try to add some longevity to their careers. So, that's probably the most, is highly, highly motivated population. AG: And so, just to start out, let's talk about how important nutrition is. Why is this something we're even talking about today? JR: Great question. Everybody's got to eat. I look at it this way, that nutrition won't be necessarily the difference maker. Having a solid nutrition program will not make you make it through this training pipeline. However, poor nutrition can be the reason that you don't make it. So, we definitely see early on, in the early parts of phase and early parts of training when the intensity level is very high, we see low blood sugar or hypoglycemia. We see dehydration, we see heat injuries, and so, the individuals coming through the pipeline, the students who aren't hydrating, who aren't fueling high enough are going to get that low blood sugar, and it doesn't matter how motivated you are, how fit you are, how strong you are, if you have low blood sugar, you can't perform. And so, I like to say that it won't be the reason you make it through, but it absolutely can be the reason that you don't, so I want to eliminate that. AG: Okay, on the flipside, there's certain diets and certain eating choices that you make that can make you perform at your best… (JR: Absolutely) So, what are some things that you would recommend?